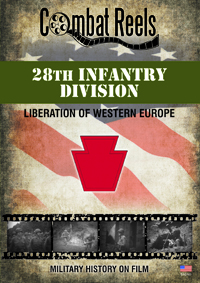 This DVD about the 28th Infantry Division takes place in World War II during the Fall of 1944, Europe. On the first day of August 1944, the 28th Infantry Division, also known as "Keystone", was fighting with the XIX Corps of the U.S. First Army. The division was attacking south after the Breakout from Normandy and would hold the Westernmost edge of the Falaise Gap. Our Series II DVD, Liberation of Western Europe begins here and ends at the beginning of November 1944, as the 28th moves through the Hurgten Forest. The contents of this video show the action as was recorded by the 163rd, 165th and 167th Signal Photo Companies, during this historic operation. The military history footage in this video is intended to be strictly that of the 28th Infantry Division and only shows other unit footage when two or more units are intertwined. Combat Reels has researched and compiled all of this raw combat film footage, then reformatted it into the DVD format for your viewing pleasure. Great for veterans, families, military historians and military enthusiasts, this DVD has many different scenes of 28th Infantry Division soldiers. See 28th soldiers moving in to Percy and searching for snipers. Next see medics tend to wounded as other men live in foxholes. Watch various units fight through the hedgerows and search destroyed equipment as they push to Elboef, France. Then the liberation parades of Paris is shown, as many units of the 28th march down the Champs Elysees near the Arc de Triumph. The film closes with scenes of the 28th Fighting alongside the 5th Armored in September and troops of the 28th moving through the Hurgten Forest near Vossemack, Germany in early November 1944. Order your copy today and enjoy these and many more up close shots of equipment, vehicles, weapons, uniforms, helmet markings, and of the faces of the men of the 28th Infantry Division themselves on these candid movie film reels of history, presented to you on popular DVD formatted video!